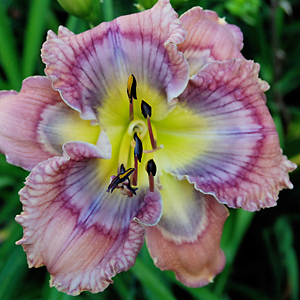 ANGEL LOVE (Dan Trimmer) Tetraploid (Dragonfly Dawn X Waves Of Joy) 27" E. Re. Ev. 6" (Sdlg. 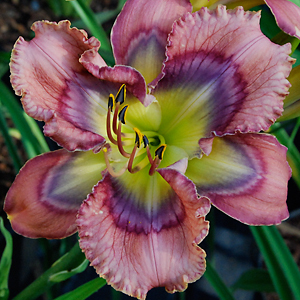 2-35) This pink lavender bloom with the double dose of Dragonfly Dawn through WAVES OF JOY is another producer of patterned offspring. 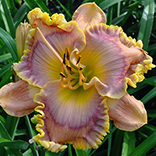 Rather dark early in the bloom season, the base petal color is much paler later on. Fertile both ways, typical branching is a single lateral branch, a terminal Y and about 17 buds per scape. Numbingly vigorous, ANGEL LOVE has only bloomed twice for us yet we have enough plants to offer her with limited stock.